How can we turn Earth’s temperature down? 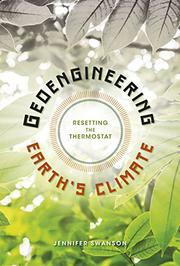 An author of nonfiction for young readers on a wide range of topics takes on the controversial subject of geoengineering: purposeful human efforts at global climate change. With clear, information-packed exposition organized into short chapters and broken up with subheadings, diagrams, and photographs, she moves from a general overview and history to a consideration of two specific areas: carbon-dioxide removal and sun shields. She explains the greenhouse effect, the biological, industrial, and geological carbon cycles, photosynthesis, and the effects of ocean acidification and algal blooms. She talks about the importance of balance: avoiding efforts that will tip the climate from too warm to too cold. She points out the possibility that large-scale solar-radiation management could lead to a de-emphasis on reducing the amount of greenhouse gases being added to the atmosphere. Most importantly, she states that these global solutions are extremely controversial. Methods suggested so far would be expensive, possibly wildly impractical, and likely to have unintended consequences. But, she argues, quoting some of the researchers she consulted, continuing to explore these possibilities is vital in the face of the overwhelming evidence that our climate is changing for the worse.